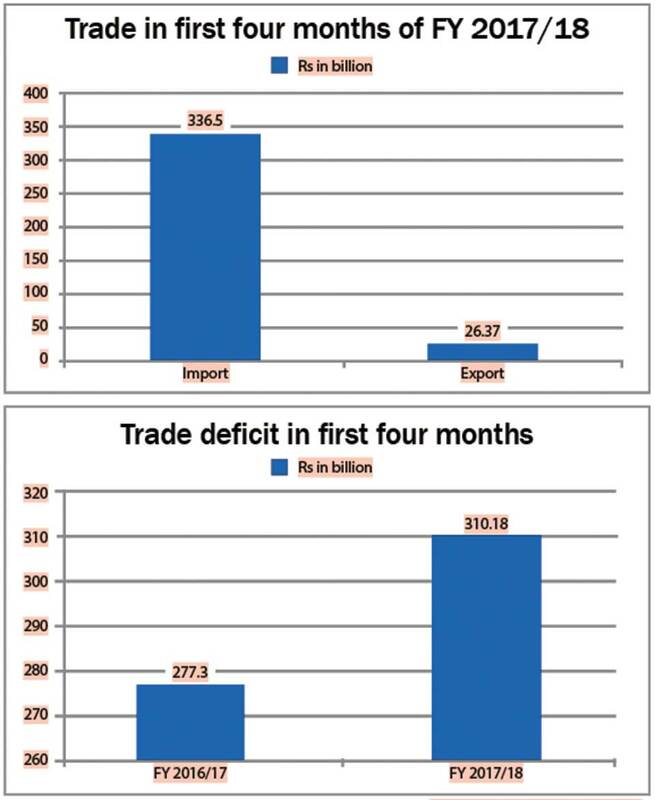 KATHMANDU, Dec 24: Total trade deficit of the country jumped 11.86 percent in the first quadrimester of the current Fiscal Year 2017/18 as imports continue to climb at a faster rate amid a sluggish growth of exports. According to the Department of Customs’ latest data, Nepal imported a total of Rs 336.56 billion worth of goods and commodities in the first four months of the current Fiscal Year 2017/18, while the total export bill stood at Rs 26.38 billion. The total import is 11.52 percent higher than the corresponding period of the last fiscal year. Exports, on the other hand, grew only 7.7 percent. 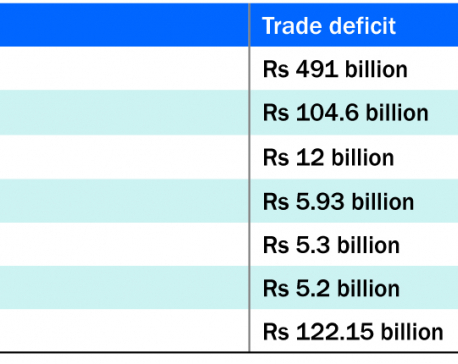 The trade deficit widened by Rs 32.89 billion to Rs 310.18 billion in the review period. As always, trade imbalance with India remained highest. Nepal exported a total of Rs 14.09 billion worth of goods and commodities to India while the total import bill stood at Rs 218.1 billion, leading to a trade deficit of Rs 204.01 billion with the southern neighbor. China is the second biggest trading partner of Nepal with whom trade deficit remained at Rs 42.32 billion in the first quadrimester. Out of 128 trading partners, Nepal registered trade surplus with only 24 countries. Turkey, Italy, Norway, and Portugal are some of the countries with whom the trade relation is in favor of Nepal. Except India and China, trading volume with rest of the countries is very negligible. The bilateral trade with the other countries was not even worth Rs 10 billion in the first quadrimester. It was fuel that had the highest share in the import bill of the country. According to data, the country imported fuel worth Rs 45.58 billion in the review period. This was followed by iron and steel product which accounted for Rs 34.63 billion. On the other hand, coffee and tea were the commodities that Nepal had exported the highest amount in the review period. Nepal exported coffee and tea worth Rs 2.83 billion, followed by carpet worth Rs 2.42 billion. Though the ballooning trade deficit of the country has become one of the major macroeconomic concerns, the government has not made any significant effort to address the problem. The surge in the trade deficit is also likely to send the current account and balance of payment into deficit. Even the plan of the government to launch a white paper on trade deficit of the country has not materialized yet. Alarmed by the galloping trade imbalance, the government announced the plan to come up with the white paper last month. The white paper was expected to describe the status of a situation or crisis, remedial measures and things-to-do by concerned ministries and departments for a coordinated effort on boosting exports and narrowing down trade imbalance. However, the government has not yet issued such paper as the government officials seemed to be divided over such plan. 1:12.8 as of the first quadrimester, according to the department.